Living in the islands of perpetual summer and being fortunate enough to enjoy sunshine around 90% of the year, I have had plenty of time to get my summer wardrobe and summer essentials pretty much sorted. Summer seems to be flying by (June disappeared in the blink of an eye!) 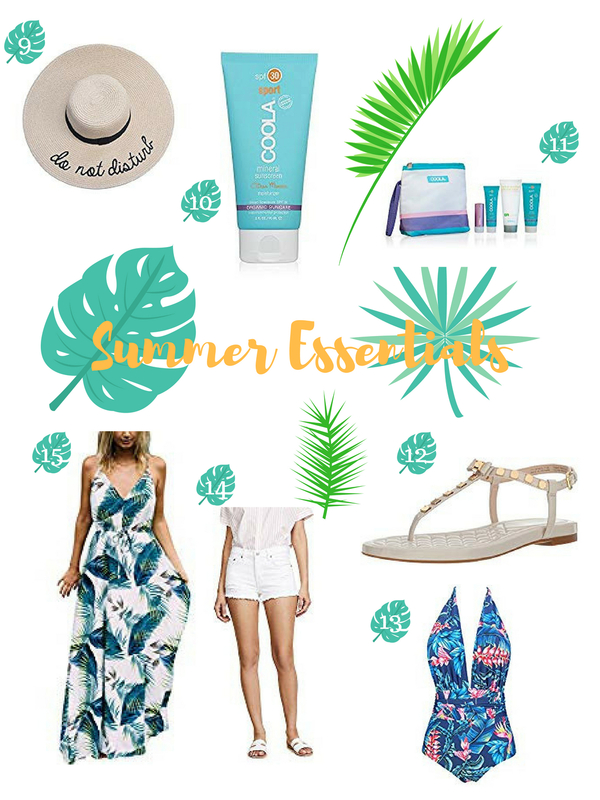 but we still have plenty of warm weather left and I wanted to share some of my summer staples with you. From top to toe I’ve got you covered. 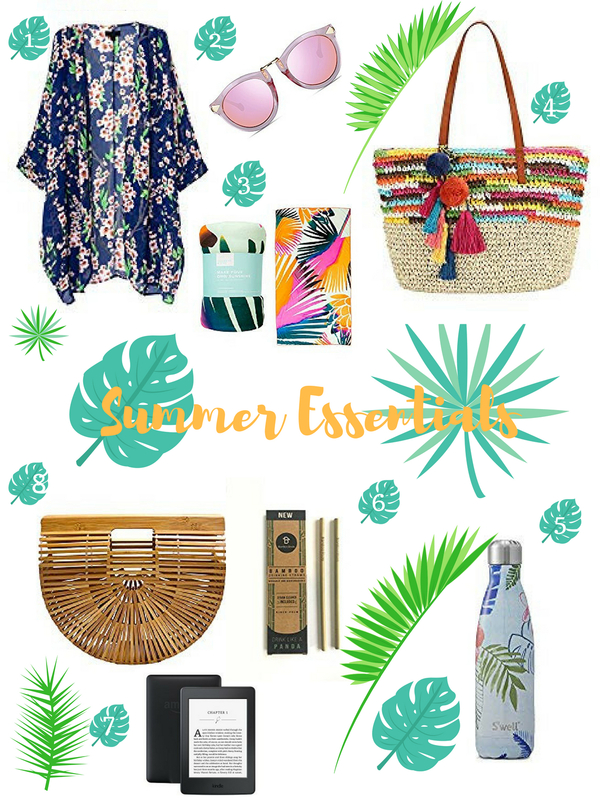 So, whether you’re going on holiday soon, or just enjoying some warm days in the park in the sunshine, these are a few of my summer favourites! A great kimono can really elevate that simple shorts and t-shirt outfit. It adds a splash of colour and an additional layer of interest. They’re chic and they keep the sun off your shoulders, win win. They are also great for keeping in your beach bag and throwing over your swimsuit as a cover-up. I favour a bright floral or a leafy palm print. These Amazon kimonos are fantastic for only $15 and come in 26 colours and patterns. 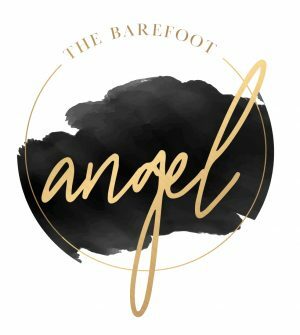 Featured in my FabFitFun Summer box (and now available on Amazon.com), I was an instant fan of this lightweight and quick-drying beach towel. I hate carrying home soggy beach towels full of sand after a day by the ocean. This beauty is a great size, a vibrant print, easy to pack and you can just brush the sand right off! A beach day game changer! I have a number of really cute beach bags, and switch between them regularly, but sadly that still doesn’t stop me constantly looking for new ones! I am a complete sucker for a pom pom or a tassel – which is why I am totally obsessed with this one by Daisy Rose, isn’t it adorable? I love the neutral straw with the brightly colored embroidery and the tassels are to die for. I also love the striped inner pouch and the fact that it has a zip closure to keep all my beaching knick knacks secure. It is on my wishlist!! I have been a big advocate of reusable water bottles for the longest time. But, as the weather warms up, it’s even more important to ensure that you are appropriately hydrated and carrying around one of these full of icy water can help ensure that you won’t get sucked into buying single-use plastic bottles of water when you’re out and about and start to feel that thirst! Keeping your water cold for a whopping 12 + hours, throwing one of these in your beach bag makes life so much easier. S’well does lots of beautiful patterns and colours, but I love my tropical print bottle. In my bid to cut down on the amount of plastic I use I have been attempting to ensure that I have reusable alternatives to the common plastic straws when I am out. There are so many available on the market but the two I have tried so far are these beautiful copper ones and this bamboo set. Yes, it’s a little bit more effort to walk with these, and you have to clean them! But plastic straws are so bad for the environment and just so unnecessary! Starbucks hit the news last week as they revealed that they will be phasing out plastic straws and eliminating more than 1 billion straws a year by completely eradicating them from their stores by 2020. I say ‘Bravo!’ to Starbucks and urge you to join in on this initiative! There is no better accompaniment to your beach time or pool time than a really good book. In fact, I have a post on my recommended summer reads that you can check out right here! I have been a kindle convert for some time now (I literally can’t leave home without it) because I love the freedom of having so many books at my fingertips, if I finish one – no problem, I have another just waiting to get started. It’s so freeing taking all those great titles with me in my beach bag without any of the weight of carrying the books. Recently I have been thinking about starting with audible too – might be good for workouts or when you’re lying by the pool just gently snoozing. Have any of you tried it? Audible have an offer at the moment for two free audible books when you sign up for a free 30-day trial, which I might just need to take advantage of. 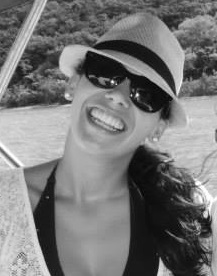 A great sunhat is an absolute must for the summer! Fantastic for keeping the sun off your face and protecting your most delicate skin. (Also a great photo prop in my honest opinion…) I like to keep one in my beach bag just in case. I love all the summer hats with the cute adorable embroidered sayings. I already own this perfect ‘do not disturb’ hat, but there are a couple more that I have my eye on! I shouldn’t need to tell you that spf is so important for the summer months. Regardless of whether you are going to be sunbathing or not, at the very least you need to make sure that the delicate skin on your face and décolletage is protected, even as you go about your errands. I discovered the Coola products a year or so ago and I love their organic formulas. Even better news, the Coola Mineral Sunscreens are also reef safe! I had been researching sunscreens a lot recently with the increasing amount of information coming out about the risk of regular sunscreen to our delicate reef life. Oxybenzone (one of the main active ingredients in the majority of sunscreens) is a major contributor to coral bleaching. Hawaii has lead the way in banning sunscreens containing reef harming ingredients like Oxybenzone and hopefully it won’t be long before other places follow suit. Get ahead of the curve and start looking out for reef-safe sunscreen. I was thrilled to discover that I could still use my favourite brand if I was just a little more selective about which of their products I was using. Also available – this cute 4-piece Coola Mineral Travel Set. Obviously a great pair of sandals is a must for summer weather – a little smarter than flip flops but still super comfortable and practical for sand and cobbles and other holiday terrain. I like a pair with a bit of interest, so these studded beauties are just perfect. I think that they are somewhat reminiscent of the gorgeous Rockstud Valentino sandals, without being an obvious dupe. They have great reviews! I feel like people are always really surprised to learn that the majority of my swimsuits come from Amazon. Like maybe they hadn’t considered Amazon as a place to shop for swimwear? I own a couple of these Cocoship suits and absolutely love them, they are fantastic quality for the low price and come in a lot of different colours and prints. The high-waist is super flattering and they are surprisingly supportive… giving you the perfect 50’s pin-up figure! I feel like this pretty blue and red floral one needs to come home with me! An absolute summer essential, I virtually live in mine. I love a white pair for a clean and fresh look. Pair with a vest top, a t-shirt, a cami, a tunic or just a bikini top. Super versatile, perfect for pool days, no self-respecting summer wardrobe should be without a pair. Is there anything more comfortable or flattering when the weather heats up than a loose and flowy maxi dress? Super forgiving, covering a multitude of sins, the maxi dress is a summer wardrobe essential. Amazon.com have some beautiful and affordable beach maxi dresses, which are so easy to wear but still make you look really put together. Perfect for evenings out after a day at the beach, or for summer brunches with friends. I love this tropical and leafy maxi, but it comes in 8 different colours and prints, if this one isn’t for you. Amazon Prime Day starts today and there are hundreds of special deals exclusively for Prime subscribers. If you haven’t yet signed up for Amazon Prime you can start a 30-day free trial today. Which would be your picks?? Love your list, especially that printed maxi dress! Great post! Those sunglasses are amazing! I may need a pair also!! Ooh! I love this image on this post. The bamboo bag is a must have for the summer and something to read. We went to the beach and that Kindle would have been perfect. Thanks for sharing. I was born in the Caribbean, grew up in Florida and now live in California so I’ve accumulated pretty much all of this stuff now. But I still need to look into reusable straws — great idea. Love that maxi dress! I have a S’well water bottle and I love it! Thanks for sharing the fun finds! Love this! I especially like the kimono and the hat. Perfect for summer! That beach towel looks really cool. I definitely would want to check that out. I keep meaning to find a cute kimono for summer! Also, I agree on the straw thing. Although they’re expensive, I bought a 4 pack of metal straws for the toddler. Single use plastic is so terrible for our environment, and every piece made so far is still on our planet – yikes. I wish there was some sort of cute pouch for them though, for carrying in a purse. Thanks for sharing your essentials! So many cute and useful finds <3. I love my Kindle for beach days as well but I don't know if I am a fan auf audiobooks. Have already signed up for audible? How do you like it? Love all this summer essentials 🙂 I need a beach bag like that one. I think it’s so pretty!